Land Banking strategies are a secret tip employed by the both the savvy, not just the wealthy. Land banking is timeless. The power of land is universal. The pressure of an exploding population on unimproved land places the owner of that land in an enviable profit-making position that will never again exist. Once the land is improved, the original opportunity is gone.They are historically one of the most conservative and secure business models in real estate today. That's exactly what smart land banking investors do. They simply buy undeveloped land in the path of growth of rapidly developing cities and then hold onto it for a few years or develop it and sell it off for significant profits. This is not a new concept. Many people have made a lot of money doing it and many other world famous personalities have made fortunes by investing in Land Banking. For example; The Rockefellers, Donald Trump, Richard Branson, Howard Hughes, Walt Disney, Robert Kiyosaki (Author of Rich Dad Poor Dad) to name but a few. Invest while prices are still affordable, where there's room for growth, and where the potential for profit is greater. This means buying land at the pre-developed stage. One could compare purchasing land at the pre-developed stage to purchasing at wholesale, while purchasing land at the developed stage to purchasing at retail. All these elements can be found in Playa Del Carmen. Where is the best place to Land Bank? Location, Location, Location. Smart investors can identify desirable land by looking at several key factors: demographic patterns, migration patterns, housing patterns, economic growth patterns, geographic considerations, and public/private investment patterns. 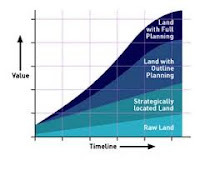 Land Banking Investors understand and even predict these variables through careful research. Knowledgeable Land Banking Investors can project future growth based on historical information from similar areas over almost any 5-10 year time period. This is the Best Kept Land Banking Secret: Playa Del Carmen affords the savvy investor this excellent opportunity.